High output metal halide bulbs are notorious for their brightness drop in the first few thousand hours of use, with even high-quality pulse-start electronic units declining to 60% of the original light output within a year of use. Newer fluorescent tubes might do a little better but within two years, their electrodes begin to sputter and the tubes blacken. Sodium lights do better yet, but again, not for long, and do you really want lights with an orange hue? On the other hand, plasma bulbs simply keep going and going. With no filament or electrode that undergoes physical wear, the bulbs are designed to last the life of the lamp and can outlast even LED bulbs. 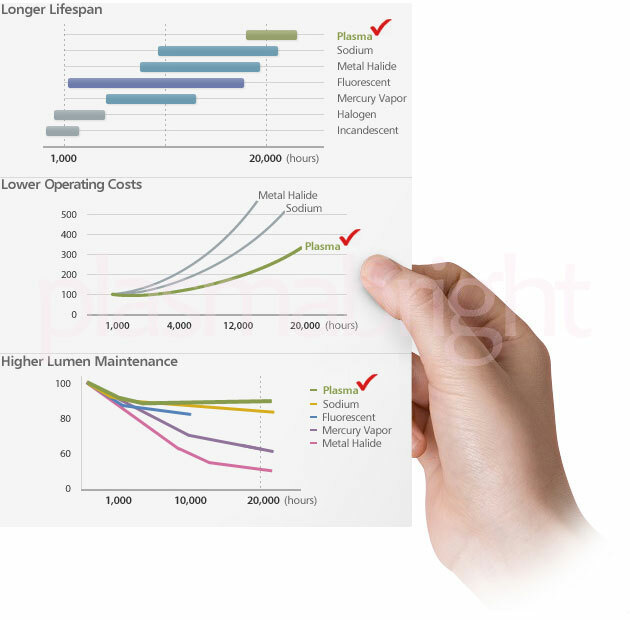 The life of plasma luminaires are dependent on ever improving magnetrons, which will typically last 40k hours. Unlike LED bulbs that diminish in light output and lifespan with higher operating temperatures, plasma lights don't have such restrictions and can safely operate at up to 50° Celsius or 122° Fahrenheit for the full life of the product.